The United States both conducts and finances much of the biopharmaceutical innovation that the world depends on, allowing foreign governments to enjoy bargain prices for such innovations. This indicates that our current policies are neither wise nor just. Simply put, other nations are free-riding, or taking unfair advantage of the United States’ progress in this area. Medicines in the U.S. frequently cost significantly more than the same versions in other advanced countries. ... But what often goes overlooked in these discussions is the fact that pricey medicines in the U.S. actually subsidize research and development for the rest of the world, and for all the proposals to lower drug prices in the U.S., a solution to this particular imbalance is nowhere in sight. Though the same article reproduces evidence that the industry spends far more on marketing than on R&D (which could be interpreted as an argument that it isn't R&D that is being subsidised but excessive marketing, an issue addressed in this question here). 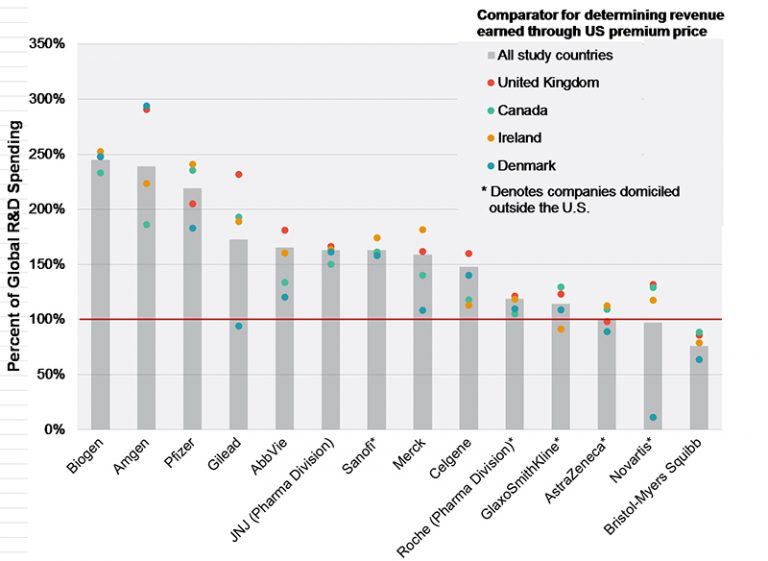 Do US prices for pharmaceuticals subsidise R&D that benefits the rest of the world? Yee-es?!? The pharmaceuticals in the US are subsidising something. But what that is is certainly not anything that benefits the rest of the world. The sentences in the claim in question are blatant lies. US prices end up as profits for a large part and are not reinvested, certainly not into research and development of new drugs, as the industry likes to claim. These lies are used, as the great philosopher DJ Trump once said: "to get away with murder." 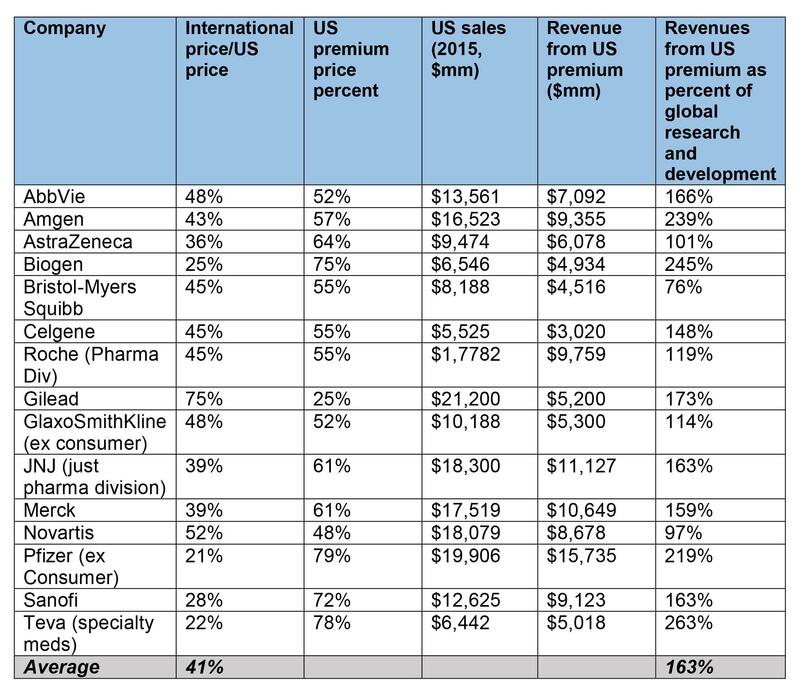 The top 10 pharma R&D budgets in 2016 Swiss oncology major Roche was tops in total terms, spending a massive CHF11.53 billion ($11.42 billion) last year, nearly 23% of its CHF50.57 billion in revenue. It also recorded a 20% jump in R&D spending compared with 2015, the biggest increase among the top 10, with most of this increase going into its pharmaceuticals divisions, the rest into diagnostics. That does of course not prove whether US profits are also driving Swiss innovation, but it shows that the self-reported relation between revenue and R&D might not be always so much in favour of US based companies in this regard. Comment: We found that the premiums pharmaceutical companies earn from charging substantially higher prices for their medications in the US compared to other Western countries generates substantially more than the companies spend globally on their research and development. This finding counters the claim that the higher prices paid by US patients and taxpayers are necessary to fund research and development. Rather, there are billions of dollars left over even after worldwide research budgets are covered. To put the excess revenue in perspective, lowering the magnitude of the US premium to a level where it matches global R&D expenditures across the 15 companies we assessed would have saved US patients, businesses, and taxpayers approximately $40 billion in 2015, a year for which the Centers for Medicare and Medicaid Services (CMS) reported that total US spending on pharmaceuticals was $325 billion. A common justification for high cancer drug prices is the sizable research and development (R&D) outlay necessary to bring a drug to the US market. A recent estimate of R&D spending is $2.7 billion (2017 US dollars). However, this analysis lacks transparency and independent replication. The cost to develop a cancer drug is $648.0 million, a figure significantly lower than prior estimates. The revenue since approval is substantial (median, $1658.4 million; range, $204.1 million to $22 275.0 million). Unregulated markets lead invariably to crisis and failure. Source: The list was published by members of the U.S. Department of Commerce and the Bureau of Economic Analysis. Xanax, or Alprazolam is covered under U.S. Patent 3,987,052, which was filed on 29 October 1969, granted on 19 October 1976, and expired in September 1993. Market prices for this drug do not reflect recent development costs. Meanwhile, telling “innovation crisis” stories to politicians and the press serves as a ploy, a strategy to attract a range of government protections from free market, generic competition. How much does research and development cost? Although the pharmaceutical industry emphasises how much money it devotes to discovering new drugs, little of that money actually goes into basic research. Data from companies, the United States National Science Foundation, and government reports indicate that companies have been spending only 1.3% of revenues on basic research to discover new molecules, net of taxpayer subsidies. More than four fifths of all funds for basic research to discover new drugs and vaccines come from public sources. Moreover, despite the industry’s frequent claims that the cost of new drug discovery is now $1.3bn (£834m; €1bn), this figure, which comes from the industry supported Tufts Center, has been heavily criticised. Half that total comes from estimating how much profit would have been made if the money had been invested in an index fund of pharmaceutical companies that increased in value 11% a year, compounded over 15 years. While used by finance committees to estimate whether a new venture is worth investing in, these presumed profits (far greater than the rise in the value of pharmaceutical stocks) should not be counted as research and development costs on which profits are to be made. Half of the remaining $0.65bn is paid by taxpayers through company deductions and credits, bringing the estimate down to one quarter of $1.3bn or $0.33bn. The Tufts study authors report that their estimate was done on the most costly fifth of new drugs (those developed in-house), which the authors reported were 3.44 times more costly than the average, reducing the estimate to $90m. The median costs were a third less than the average, or $60m. Deconstructing other inflators would lower the estimate of costs even further. Complementing the stream of articles about the innovation crisis are those about the costs of research and development being “unsustainable” for the small number of new drugs approved. Both claims serve to justify greater government support and protections from generic competition, such as longer data exclusivity and more taxpayer subsidies. However, although reported research and development costs rose substantially between 1995 and 2010, by $34.2bn, revenues increased six times faster, by $200.4bn. Companies exaggerate costs of development by focusing on their self reported increase in costs and by not mentioning this extraordinary revenue return. Net profits after taxes consistently remain substantially higher than profits for all other Fortune 500 companies. This hidden business model for pharmaceutical research, sales, and profits has long depended less on the breakthrough research that executives emphasise than on rational actors exploiting ever broader and longer patents and other government protections against normal free market competition. Companies are delighted when research breakthroughs occur, but they do not depend on them, declarations to the contrary notwithstanding. The 1.3% of revenues devoted to discovering new molecules compares with the 25% that an independent analysis estimates is spent on promotion, and gives a ratio of basic research to marketing of 1:19. Prescription drug prices in the United States have been among the highest in the world. And given the facts available, that is not easily interpreted in any other way as U.S. Prescription Drug Costs Are a Crime. The latest furore over U.S. drug costs was prompted by the decision by unlisted Turing to hike the cost of an old drug against a parasitic infection to $750 a pill from $13.50. It has since promised to roll back the increase. Looking at the relationship between advertising, promotion on one side and the actual development put forward with increasingly abysmal results for US based innovations makes it much more urgent to look at other reasons for price increases. One reason often heard is that pharmaceutical companies are very simply not non-profit-organisations. One reason U.S. prescription drug prices are higher may be the relative lack of price control strategies. Unlike the U.S., many other countries employ centralized price negotiations, national formularies, and comparative and cost-effectiveness research for determining price ceilings. In the U.S., health care delivery and payment are fragmented, with numerous, separate negotiations between drug manufacturers and payers and complex arrangements for various federal and state health programs. And, in general, the U.S. allows wider latitude for monopoly pricing of brand-name drugs than other countries are willing to accept. Most of the research and development is financed from external, public sources. The money that is captured via US prices is not spent on research, but on manipulation, mergers, and maximum payouts. Why are they doing this? Because they can. What are the drug prices in the US subsidising? We can't examine all the claims regarding drug development but it is clear that for many drugs it is an international collaboration. In 1979, Junming Le, PhD, was one of the first Chinese citizens to receive a United Nations fellowship for study in the U.S.
At that time anti-TNF drugs were being studied to treat sepsis but it was in the Kennedy Institute, Charing Cross Hospital in London that anti-TNFs were shown to be unexpectedly successful in treating rheumatoid arthritis. We were not able to convince any of these companies in the UK, but when a small US biotechnology company, Centocor, hired my ex-student, Dr James N. Woody as Chief Scientific Officer, we had an ally who understood both the science and the medical implications. The crucial first proof of principle clinical trial was performed at Charing Cross Hospital, London, with Ravinder Maini and Marc Feldmann as Principal Investigators, with Centocor providing the ‘drug’, cA2, a chimaeric (mouse anti-TNF FAb linked to human IgG1) antibody developed from a hybridoma made in Jan Vilcek’s laboratory at New York University, and a small grant to the Kennedy Institute, which was then in London on the Charing Cross Hospital campus. It's clear prices in the USA far exceed those elsewhere. For example, Humira costs $48,000 per year yet in NZ that price is likely closer to under $10,000 per year to the NZ Government. However, the exact contract price is a commercial secret. As expensive as these drugs are, and extremely expensive anti-cancer agents, it could be argued that the world does not depend on these drugs. Yes, patients would be worse off, but we are not talking huge numbers and often not life saving. And in the case of anti-cancer drugs we are often talking about life extension of only a few months. However, the flu vaccine is life saving and countries depend on its existence. But the vaccine is developed in 5 centers worldwide as a collaborative effort. All year long, 142 national influenza centers in 113 different countries collect data on the flu viruses impacting the world’s population. Specifically, they monitor which strains of the virus are making people sick, how efficiently those strains are spreading, and how well previous vaccines have worked to combat their targeted viruses. Critical progress was subsequently made by Youyou Tu, who was inspired by the detailed methods of Artemisia usage described in ancient Ge Hong’s book “Zhou Hou Bei Ji Fang”. The book reads: for the treatment of malaria “a handful of Artemisia soaked in two liter of water. Take the pressed juice.” She deduced that the disuse of decoction (by boiling) may imply thermo-instability of active principles, which nonetheless may be lipophilic. Therefore, she switched from ethanol to ether as the extraction solvent. After removing the acidic principles, white solids were isolated from the neutral ethereal extraction, which exerted 100% inhibition against mouse P. falciparum. The white solids were later identified to be artemisinin (1) (Fig. 1). The discovery of artemisinin from the ethereal extraction certainly played a critical role in opening new therapeutic means and saving millions of lives from malaria illness. It also justifies Youyou Tu’s sharing of the 2015 Nobel Prize for Physiology or Medicine. So, modern medicine and drug discovery is an international collaboration, and the rise in price of drugs in the USA appears to the cynical to be driven by other factors than just paying for past research and development. Not the answer you're looking for? Browse other questions tagged united-states economics pharmaceutical drug-development .